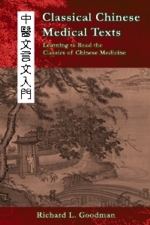 This is the first introduction to classical Chinese that focuses solely on medical texts. The selections that make up the chapters range from the late Han to the Qing dynasties a period spanning over 1,500 years. The extensive vocabulary lists, detailed grammar notes, example sentences, and clear writing make this book suitable for self-taught learners and classrooms alike. Each chapter contains the text in its original as well as modern written forms, a vocabulary section, pinyin, translation of the texts, and a detailed notes section which explains grammar and difficult sentences.